Iceberg lettuce is nutritionally inferior and actually quite bland compared to any of the excellent salad greens below. Choose one or better still a combination of any of these. Often a combination of the more peppery leaves like arugula, radicchio and watercress works very well with mixed with lighter tasting greens like baby spinach, romaine lettuce or endive. A handful of greens per person is generally a good amount but adjust to how hungry you are. You’re certainly not going to put on weight by eating more greens and it’s much better to fill up on these than high carbohydrate foods. Tomatoes, cucumber and avocados are great in salads but there’s so many different types of fruits and vegetables you can experiment with. Pick from the following and try combining savory like red onion, bean sprouts and celery with sweet like apple, mandarin or grapes in the same salad for a balance of flavors. 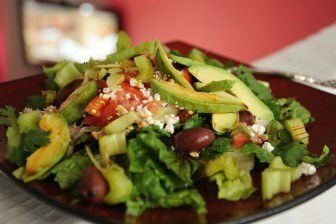 You can make your salad as simple or elaborate as you like. Just half a chopped avocado with a few halved cherry tomatoes tastes great. While a medley of thinly sliced apple, celery, carrot, bell pepper and grapes makes an excellent combination with a broad range of nutrients for better health. You don’t need much of these toppings to add a burst of flavor to any salad. Chop toppings like chicken, cheese or salmon up well so they mix through the salad. Here’s some suggestions but try any healthy foods that you like. Generally just 1 or 2 of these toppings is best for most salads. Try olives and salmon, walnuts and feta or pumpkin seeds and fried mushrooms for some great flavors. Simple salad dressings are best. There’s no need to overpower the flavors with heavy dressing. Here’s some good combinations. The general ratio is 3 parts oil to 1 part vinegar. Add 1 part citrus juice, garlic, mustard or other finishing ingredients. Throw them all in a sealed jar or container and shake up well for a quick and simple salad dressing. There’s a couple of extra steps that can help to turn a good salad into a really great salad. Wash your greens in hot water and a splash of vinegar to clean them. Transfer them into a salad spinner and spin off the extra water. Drying greens in this way makes for a better tasting salad. Chop your salad vegetables and fruits into bite sized pieces. This only takes a little longer and everyone will appreciate the combination of flavors when you do this. For toppings, cut them even more finely. These are usually so full of flavor they are better spread throughout the salad than left in large chunks. Pour over the dressing and toss the salad with your hands just before serving. You can use a couple of serving spoons if you like but with your fingers is the best way to mix a salad properly. Eat your salad fresh. Make just what you’d like to eat and eat it as soon as you’ve dressed it for maximum nutrition and taste. Try using the 4 step formula above to make up your own salad recipes regularly. Choose at least 2 salad greens for a base, 4 salad vegetables or fruit and 2 salad toppings and pick up what you need the next time you go shopping. Remember, to make a great salad choose flavorsome greens, a variety of fruit and vegetables, small amounts of strong tasting toppings and a simple salad dressing. Wash and dry your salad greens in a salad spinner, chop up everything into bite sized pieces and dress and mix your salad well just before you serve it. There’s more healthy recipes like this for breakfast, lunch and dinner, as well as juices and smoothies, in the Superfood Recipes section. If you’d like even more fat burning recipes, 500 in fact with every kind of meal and snack covered, including many healthier salads, then have a look at this highly recommended primal recipe book. These are great tips! I follow these all the time and they always yield a delicious salad.